Donn Fendler, who says his Scout training and faith in God helped him survive nine days lost in the woods of Maine at age 12, died Monday. He was 90. Fendler’s story, recounted in his 1978 book Lost on a Mountain in Maine, seems almost unbelievable. In July 1939, the Second Class Scout from Troop 2 of Rye, N.Y., wandered away from family and friends on Mount Katahdin, Maine’s highest point. Realizing he was separated, Fendler tried to find the members of his hiking party, but it was raining so hard that he became lost. He took a few wrong turns and spent the next nine days alone. Remembering his Scout training, Fendler followed a stream, knowing that camps and towns often are found along streams and rivers. During the day, he survived by eating wild berries. He lost his sneakers and pants in the river, and his feet and legs quickly became covered with cuts from rocks and bites from mosquitoes and flies. At night, in near-freezing temperatures, Fendler wedged himself between tree roots and slept under a blanket of moss. He later found a burlap sack to use as clothing and shelter. As Fendler refused to quit, a massive search was underway in Maine. The story made headlines nationwide. But as the days wore on, optimism shrank. “I’m still trying to make myself believe there’s a faint thread of hope,” Fendler’s father, Donald, told The Boston Globe. On the ninth day, a miracle happened. Fendler, who had walked 48 miles and lost 16 pounds, stumbled into a hunting camp and saw a person. On July 25, after nine days, the ordeal was over. Fendler reached his parents by telephone. “I’m all right, mama,” he said. 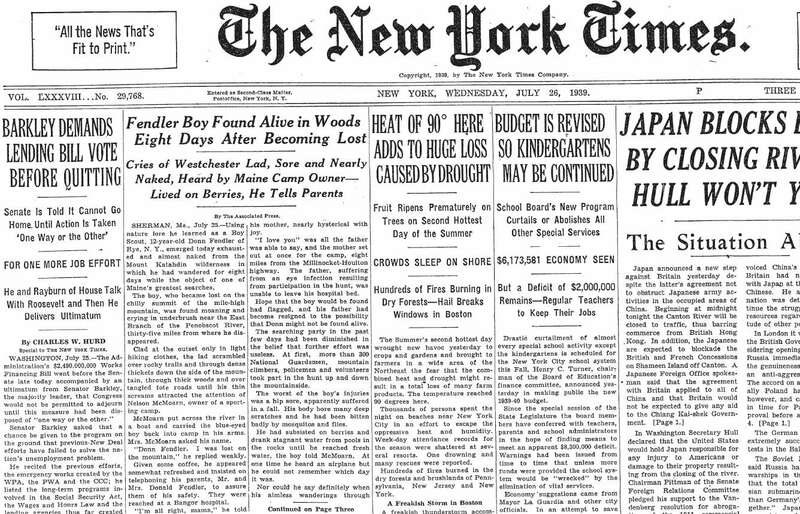 The news made the front page of the July 26, 1939, edition of The New York Times. 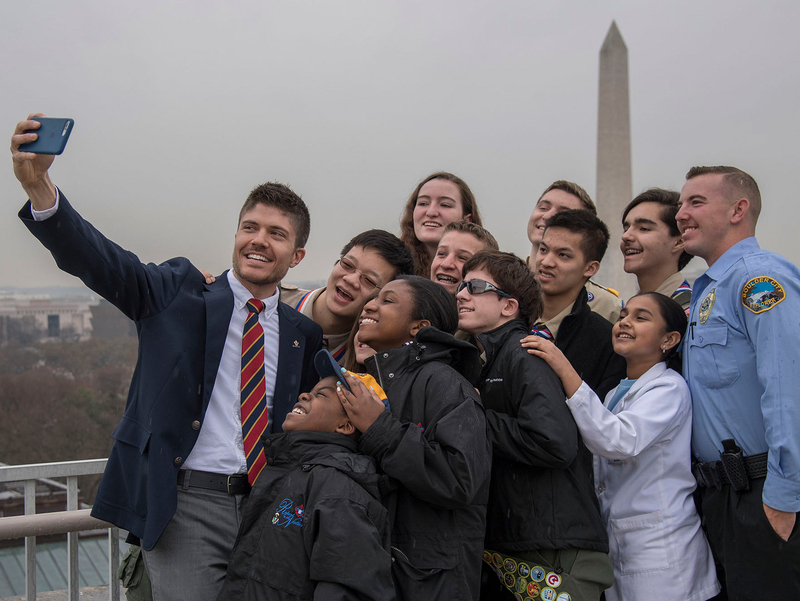 That October, at the annual Roosevelt Pilgrimage in Oyster Bay, N.Y., National Scout Commissioner Daniel Carter Beard introduced Fendler to a crowd of hundreds of Scouts and Scouters. They cheered the boy’s bravery and never-quit attitude. The next year, Fendler was invited to the White House, where President Franklin D. Roosevelt presented him with the Army and Navy Legion of Valor medal. Fendler’s book, written with Joseph B. Egan, debuted in 1978 and quickly became required reading for fourth-graders in Maine. Fendler loved going to schools and telling his story to rapt schoolchildren. His sister, Kathryn Fendler Meyers of Oklahoma, told the Portland Press Herald that she went along on several of those talks.